Elizabeth was thirty-eight years old when she wrote the first sonnet in her famous sonnet series, Sonnets from the Portuguese. She had been a semi-invalid for years and, in the sonnet, expresses a feeling that she is preparing for some great change in her life, assuming that the change will be death. 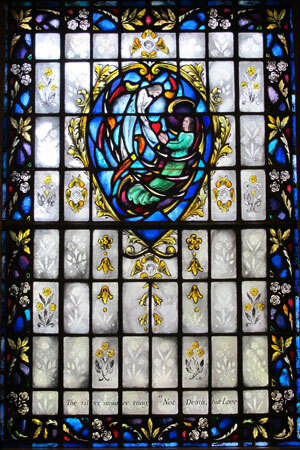 This first window symbolizes the Coming of Love. The Mystic Shape with the wings suggests the Seraphim of Love and surprises Elizabeth by dropping a red heart, symbolizing love, into her waiting hands. 'Guess now who holds thee?' --'Death,' I said.